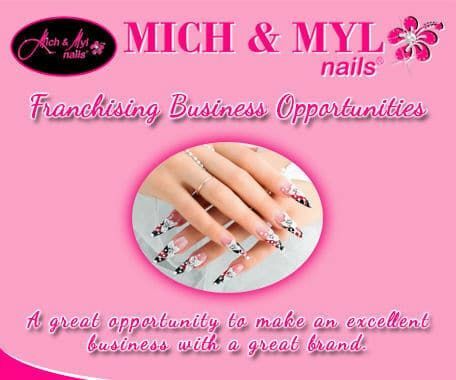 Mich & Myl Nails is focused on providing each client with professional and friendly service that is sure to change your idea of what a nail spa should be. We start by providing each of our valued clients with a licensed and professionally trained nail technician, schooled on the latest nail technique's direct from Japan, a world leader for Gel Nails, Sculptured Nails, Acrylic Nail Extensions and 3D Nail Art. At Mich & Myl Nails our professional services and products are applied in our upscale salon branches found throughout the Philippines, and we are confident that once you have tried our service in one of our Philippines Nail Salons, you will agree, that we are simply the best at what we do. Our full line of luxurious services range from just a simple manicure and pedicure to the more advanced organic foot spa, Paraffin treatments, threading, waxing all the way up to applying Japan’s latest technique’s in Gel Nails, Sculptured Nails, Acrylic Nail Extensions and 3D Nail Art. At Mich & Myl Nails our valued clients receive only the finest nail products such as OPI, OPI Infinite Shine, Essie, TINS, Orly, Ezflow, Bella Forma, Cuccio, Morgan Taylor, Leafgel Premium, Can I, T Gel, Gelish, Miss Mirage, Ice Gel and Premdoll. Guarantee and Satisfaction: We stand by all our products and services, our goal is to satisfy our clients which means that if any reason you are unsatisfied, let us know immediately and we will try to make it right. You deserve the very best,,,,, you deserve Mich & Myl Nails,,,,, Visit us Today!! Arcovia City Branch Coming Soon!